Copyright (c) 2006 Formwest Architecture. 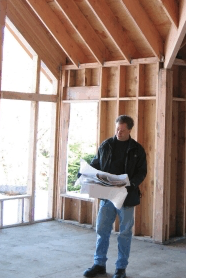 Steve Kaiser, AIA is a licensed architect with more than 30 years of professional experience serving clients of private and public sector, commercial and custom residential projects. In addition to extensive design and presentation media skills, Steve has a strong technical and project management background gained by working as a project architect on many complex renovation and new construction projects. He has also designed numerous custom residential projects, both new homes and remodels. Steve is a life-long resident of the Pacific Northwest and received his architectural degree from the University of Oregon, where he studied environmentally based principles of design under the tuteledge of renowned sustainability guru G.Z. Brown. After graduation, Steve took up residence in Portland. In the early years of his professional experience, Steve worked for a number of established, award winning firms including WE Group and SERA Architects. After receiving his architectural registration in 1993, Steve was promoted to shareholder at Yost Grube Hall Architecture, one of the foremost design firms in the city. During that time, Steve was project architect for the Oregon Lottery Headquarters and the 100 Market Building Plaza. Prior to starting in private practice, Steve worked for Carlton Hart Architecture, where he was design lead on the Persimmon Swim and Tennis Center and a low income housing project on East Burnside Street in Portland. In 1996 Steve began his own architectural practice and in 1999 formed ARCHSCAPE Architecture with longtime associate Paul Thimm. Over the next eight years Steve developed an extensive list of commercial, residential and governmental clients, while becoming well versed in all aspects of the business and architecture. In 2006, Steve launched his current firm, Formwest Architecture, to further explore the principles of environmentally responsive design, sustainability and exceptional client service. Prior to architecture, Steve studied journalism and rock climbing, but wisely decided not to follow either as a career. He has an extensive background in graphic design and art, architectural presentation media, and photography. On his time off Steve enjoys flyfishing, and spending time restoring riparian forestland on his family's historic homestead near Battle Ground, Washington. Copyright (c) 2018 Formwest Architecture. All rights reserved.